I stopped on my way to work and got 32 fluid oz of pure sweet happiness, only to have it tumble to the passenger side floor the first right turn I made. I didn't get a single sip of that delicious nectar. My pitiful supply of unused gas station napkins wasn't going to be able to do anything. And since this was at Holy Crap It's Early o'clock, I couldn't stop anywhere to get any towels or sponges or anything, so it sat and marinated in my car all day while I was at work. In what can only be described as a rank miracle, neither my phone nor any other electronics also slid down onto the floor, an occurrence that happens with alarmingly improbable frequency. 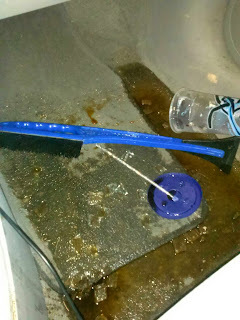 A very spurious CSI investigation afterwards pointed to a car charger cord being underneath the cup when I put it in the holder. It is currently being detained for questioning. While I didn't get to drink any of it, I did, however, get to take a bucket full of hose water and knockoff Pine-Sol and scrub away at it in the cold darkness. None of this is to say that I didn't stop a second time to get a second drink. Anyone from Pennsylvania will tell you that Sheetz fountain drinks at just the right temperature are worth making any number of stops.